The four-part docuseries shows the agony and the ecstasy of the multibillion dollar industry. What “Action” also manages to capture is the idea that putting all sports gamblers into the same simplistic category is as misguided and counterproductive as claiming that heroin addicts and recreational vapers should be filed in the same overall camp too. Though not as immediate as something like “The Trade” and not quite as formally showy as other overviews of massive money schemes (“Inside Job,” “Dirty Money,” et al. ), “Action” still gives an effective overview of the human cost of this massive multibillion dollar industry. Profitable for some, dangerous for others, and populated with a bevy of people who fall somewhere in that nebulous range between the two, it is a reminder that when discussing the human impact of policy decisions, the situation is almost always more nuanced than a single headline or simple gut reaction can be. 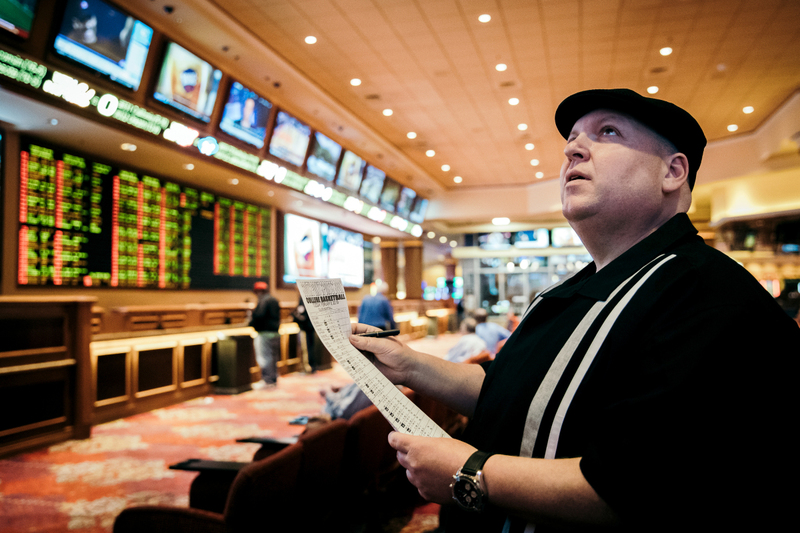 Luke Korem’s four-part series makes an attempt to examine bettors at multiple stages between those who drop a few dollars on a horse race and career gamblers demonstrating their profession in five- and six-figure swings per day. On the way, “Action” follows specific individuals who provide an indicative window into certain subcultures within the gambling world. There’s “Vegas Dave” Oancea, who by his own characterization has turned some dark, unsuccessful years of gambling failures into a thriving empire built on customers looking for easy scores. Kelly Stewart represents the growing need for media personalities to help shape public perception of gambling as a practice that can somehow be both fair and winnable all at once. The most overt “Action” gets into politics in its opening chapters is by addressing a recent Supreme Court decision legalizing gambling in states across the country and a few decades-old interview clips with the current president. But it still manages to tap into a contradiction at the heart of many American institutions. Even while extolling the virtues of responsible, efficient sports gambling, many people involved acknowledge that their success must ultimately come at the failure of someone else. Whether that failure comes on the field or in the bank notes dropped at a sports book betting desk, the bedrock of the entire zero-sum industry is that there are winners and losers. Sometimes those wins come at the expense of behemoth operations that oversee billions of dollars changing hands on an annual basis, but some of that comes from people who spend more than just college football Saturday camped out underneath the dozens of screens at casinos in Nevada, Jersey, or any number of places where this activity is now sanctioned. “Action” doesn’t put a glossy sheen over the underground elements of gambling either. In the opening half of the series, most of the direct anecdotes from the non-licensed corner of this market are confined to a single illegal bookmaker whose face and voice are shrouded. There’s an acknowledgment that violence is a real threat that some of these people risk. Another quintessential American element baked into this entire gambling structure is one of controlling narratives. If certain people can tout payouts and winning percentages as high as 70 percent when the acknowledged reputable ceiling of the best handicappers is in the high-50s range, sometimes desire can trump the harsh reality in this massive numbers game. Whether it’s examples like Stewart’s or legendary announcer Brent Musburger — who after years of winking nods to gambling lines during football games has now become a full-on gambling commentator — betting has now become another gamified commodity amped by a new generation of Snapchat missives and live webcasts. And there’s always the specter of the manipulative practices of the NCAA, who continue to rail against attacks on “amateurism” when the exploits of players in their teens and early 20s have generated a money-printing empire from which many participants will see nary a dime. Occasional montages of people at sports books end up being some of the most illustrative sequences in these episodes. Just seeing the agony of defeat and the momentary high of a bet gone right are the simplest examples of both ends of this gambling spectrum. Korem is effective at leaving it to the editing to make points that the established sports documentary structure doesn’t always leave room for. Cutting from a sparse Nevada apartment to a luxury penthouse says just as much about the respective approaches of either of the two men being profiled as anything they can say themselves. Neither a proselytizing exercise for any one sports league or a harbinger of doom for the industry overall, “Action” is more of an accounting of where things stand at the precipice of a major change. It’s also a case study in perspective: Gambling inherently brings with it a rise and fall. One person’s iniquity might be another person’s reason for being in the business in the first place. But that risk/reward divide means so much more when someone’s entire livelihood can be on the line. Like gambling experts refuting those insanely high promised win totals, “Action” is a reminder that the margin between success and failure, like so many other areas in this country in 2019, is slimmer than a lot of people care to pretend it is. “Action” premieres Sunday, March 24 on Showtime.